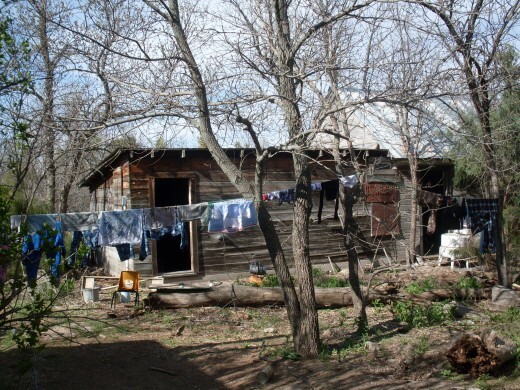 Joy has lived the old-fashioned way since 2010, when she and her husband bought a 1928 farm house, without improvements. What a journey! 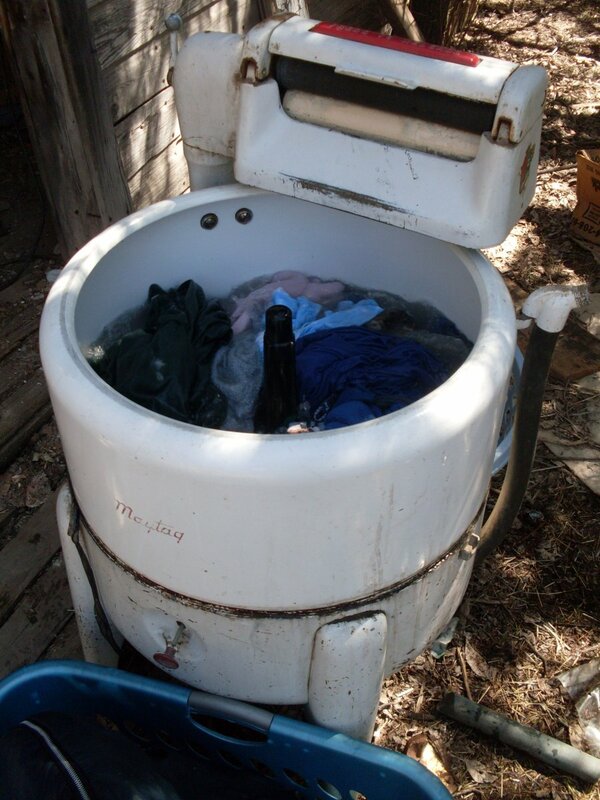 This wringer washing machine has been going strong for well over 50 years of use. Using a wringer washing machine is easy once you understand the functions of your machine, and what performance to expect. My second washer is a 1945 (?) model, and hasn't had nearly as many wash loads through it. It has some design differences, but performs similarly to the first. It is the same machine my grandmother and mother sometimes used, and now it is my turn. I will share with you some of the knowledge and tricks I have learned (mostly the hard way) for using a wringer washing machine, after I moved into a thoroughly hands-on, rural lifestyle a year-and-a-half ago. Using a wringer washer does require more commitment, physical strength, and time carved into blocks (rather than snatches) than an automatic washing machine. I prefer to commit a few hours once or twice a week to doing laundry, rather than trying to do the smaller loads many of us have become accustomed to. The Monday Wash Day Blues makes more sense to me now than it did as a child! A place to dry your clothes. My family of four uses at least 60 feet of clothes line, on average. I have to haul water in buckets to my washer (which has since these photos were taken been placed indoors), so don't like to use more than I have to. The trick to using only a small amount of water is to know in what order to wash your clothes. This may sound simple, but really, you have to pay attention. Washing laundry in this order means you can do a whole weeks' worth of laundry in one batch of wash water, and one batch of rinse water, should you choose. There are several things you should know about your wringer. Of course, the first of these is, "Don't insert fingers into wringer!" Some terrible, gross things have happened to people who tried this. (Fancy having the skin peeled back off your whole arm? I don't either.) You should, of course, keep small children away from the washer while it is in motion. To prevent injuries, and also to release stuck blue-jeans and such, you should know how to quickly release (loosen) your wringer. Many models of wringer washing machines have a catch-release of some kind, which will allow you to instantly stop and separate your wringer rollers, to release anything which is stuck. Some have a pop-up bar across the wringer frame, which, when hit, will cause the rollers to pop apart. Other models have a little bar on a pivot which, when twisted one way, will allow the rollers to separate, and when twisted the other, will cause them to stay tightly together. How to re-set your wringer for wringing action is another thing you should know before filling your washer for the first time. Some models have to be re-set by flipping the top-half of the wringer frame all the way back, then forward again until it catches and the rollers come together. Others will not re-engage until the pivot-bar is twisted the correct direction. Look your model over until you see exactly what to do - don't wait until you have a disaster on your hands to try to learn. To start the wringer action, there is typically a lever at one end of the frame which will start and stop the rolling, and, when placed in "neutral" (straight up and down), will allow you to re-position your wringer where it will be most convenient. Some washer models allow only three different position settings, others allow you to put the wringer anywhere within a 360* radius. The entire wringer can be lifted out of its place on the washer for repairs and adjustments. It is heavy! Your wringer rollers can be adjusted to compress the clothes either more loosely or tightly. You will find the adjustment screws on the underside, and you will probably have to take the wringer off the machine in order to make adjustments. If you get it too tight, you will have trouble with jeans and heavy items; too loose, and smaller items will remain too damp. Most wringer washer drains are designed to both drain into buckets, or be attached to a garden hose - whichever is more convenient in your setting. I find buckets to be the more convenient choice most of the time, but if you have a bad back, and you can drain the water far enough away from your house not to create problems, the hose may be your better choice. Many older wringer washers have hoses which have deteriorated some, and/or kinked where they attach to the washer underneath. (Appropriate replacement hoses are not always easy to find.) You may have to pinch the kink back into shape at the start of each draining period, to get maximum flow. Finally, the agitator sometimes "pops" loose. 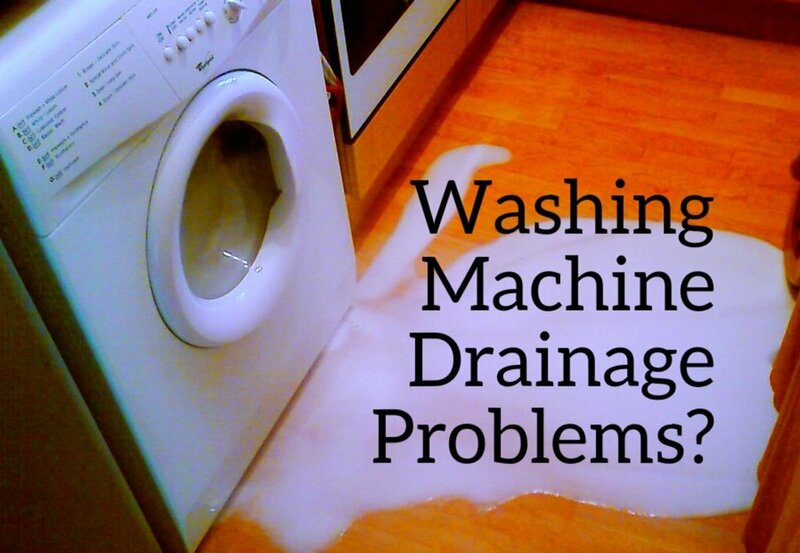 In order to fix this, you may have to drain your wash load, and then fit the agitator back into place. It may go in somewhat hard, but will fit down tightly once you have it positioned correctly. Just remember, whenever something goes wrong, there probably is a simple solution, which doesn't require a great deal of muscle. Afterall, while many wringer washing machines were designed by men, they were intended to be used by women, and therefore don't require a grizzly bear and a gorrilla to fix. 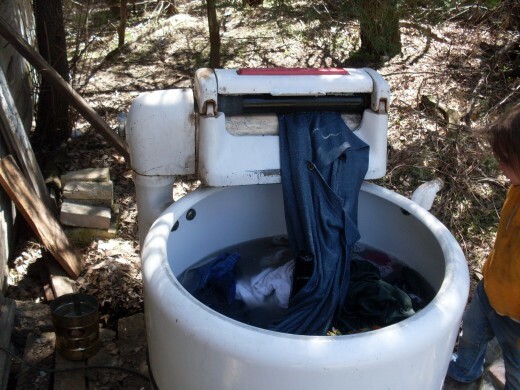 Finally, before showing you a typical wash day from early spring/late winter 2010, I will explain a bit about how to insert clothes into your wringer. As mentioned, be careful when wringing out clothes, and keep fingers, hair, and loose clothing clear of the rollers. Watch carefully as each item comes out the other side, to ensure it doesn't get angled down underneath the rollers, and wrapped up around them. (If this happens, stop and release the rollers, pull the item out, and start again. Reverse sometimes works, but only if you catch the mistake right away.) 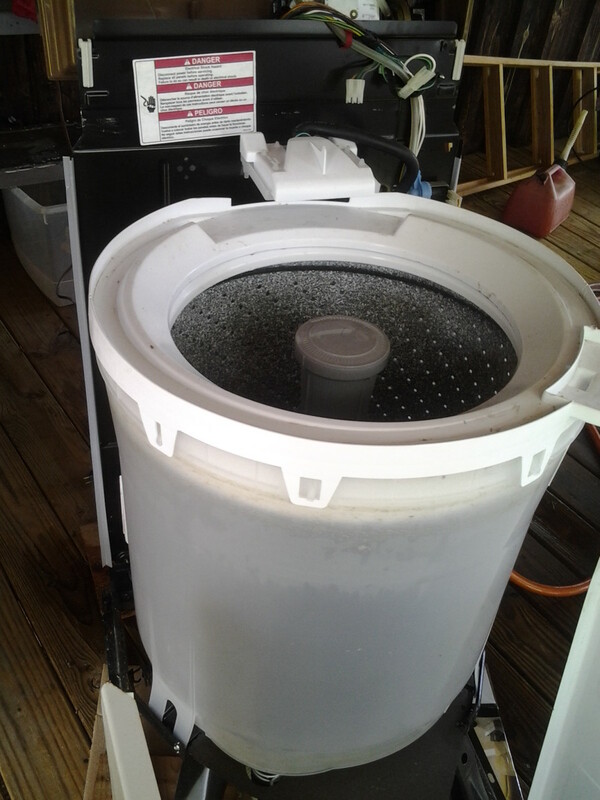 Run heavy items through twice when rinsing, for faster drying. Button-down shirts - Begin by inserting flattened collar, allowing shirt to then follow naturally through toward the tail. This will take less time than inserting it sideways or sleeve-first, and will also prevent button damage and excessive wrinkling. For buttons -not snaps - be especially careful to overlap the non-button side of the shirt over the buttons, to protect them. Blue jeans - Align waist-band (no bunching), and start at a slight angle. This will allow the jeans to go through (hopefully) without snagging, bunching, or making you cuss. Larger jeans will naturally require more care than smaller pairs, and you will soon learn exactly how to handle each pair. Some zippers do best laid flat and aligned, others prefer to spread or fold down some. Consider solving the whole problem of crushing or ripping apart zippers by zipping and fastening each pair of jeans before it goes through the wringer. Sheets, blankets, rugs, etc. - For sheets, begin with one corner, and untwist out of the washtub as you go. Run through twice, shaking the sheet out the second time to get any bunching or twists free. Rugs and very heavy items should typically be folded lenghwise, if possible. If you find that you can't get something through the wringer, just haul it out in a basket or bucket, and pour or squirt fresh water over it as it hangs on the line, to rinse it. Position baskets however it is most convenient to both fill the machine with new loads, and catch finished ones, once they've been wrung. Don't overfill baskets, unless you are a weight-lifting champion. Experience will teach you exactly how each of your items ought to go through the wringer, and how many items you can do at a time. Be sure your wringer is adjusted for maximum wringing power per the weight and style of your clothes. I have always gotten by with just one wringer washing machine at a time. However, many people prefer to use two - one to wash, and one to rinse, as this speeds the process greatly. First wash a good, big batch of clothes, and let them all sit in a basket after having gone through the wringer once. Next, empty the wash water, and fill the machine with clear rinse water. Begin as at the first, rinsing and wringing your white/cleaner items, and working your way down to the darker, heavier things. Wring heavy items twice. As each rinse load agitates, you can hang out the previous load, keeping going a continuous cycle of rinsing-and-hanging until you are finished. Wash day typically involves for me two to three hours of steady work, using no more than one batch of water. Get a five-gallon bucket 2/3 full of water, and dunk-rinse your clothes, wringing or squeezing them lightly by hand before sending them through the wringer on the machine, and into your basket of clothes ready to hang. Once you get your rhythm down, it is possible to get a week's worth of laundry for four people finished in about an hour. This method is very labor-intensive, but since I am not a fan of housework, this is my preferred method. You'll want to put a T-shirt or rag under your bucket to keep from dripping on your floor (supposing your washer is indoors). Just wash and rinse the rag last of all your clothes. Extreme delicates and some silks - the agitation motion is frequently too harsh, and may stretch or tear the fabric. Wool or denim quilts - usually too heavy, and nearly too bulky. These are better washed outdoors in a washtub, or in the bathtub. Things with large buttons or other bulky decorations - they may not survive the wringer, and even if you don't mind mending buttons and such, you may never find them again once the wringer has either eaten or tossed them. Do You Own or Have a Wringer Washer Already? How do you remove the agitator of a washing machine? I have turned it counter clockwise, but not too far. On the two wringer washers I have owned, the agitators lift straight up, with a bit of wiggling - but can be difficult, and may be stuck if the washer has been sitting a while in a shed or someplace dirty. Even with regular use, I find they're not always easy. It may be easier with some water in the tub to lessen the friction between the agitator and its post. Does the wringer washing machine go back together easily if it "pops" off with a bang? I can't seem to get the top roller back down again. I have been looking all over for a wringer washer. Can you list any places to find them? I live in Ohio. 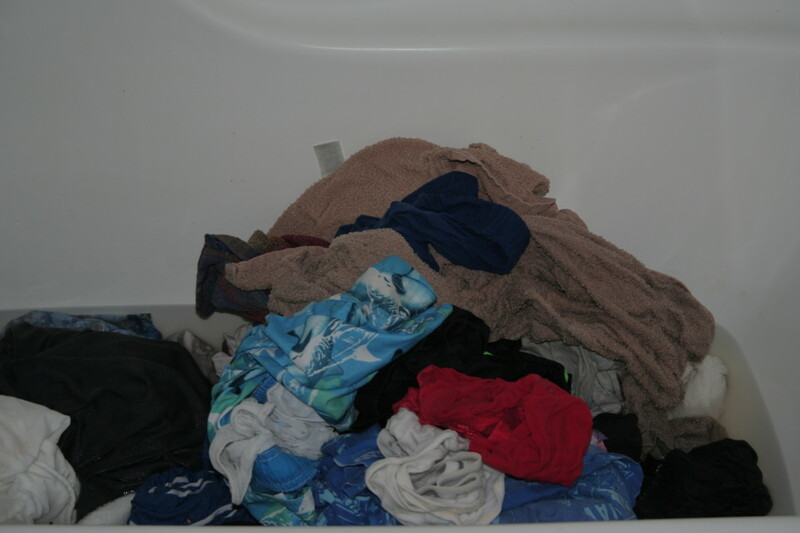 Washing Machine Broke ~ How to wash clothes without modern conveniences! Best of luck, then! 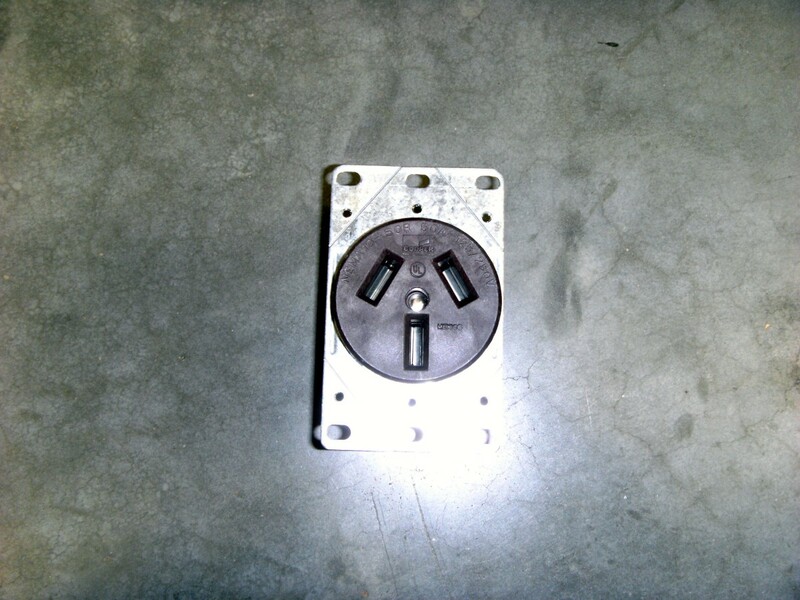 If I hear of a suitable parts outlet, I will let you know. Yes i have to replace a couple of hoses for sure and I got most of the plugged drain but still working on it. :) the washer works but the drain was plugged bad and the hoses to drain the tub are shot cracks and rips so i am going to need to replace :( i am sure i can just buy hose and fit them but would really like to order the drain lint catcher and maybe a few seals if I can and is why i am asking if anyone knows a place I can order from. beattywringer, you may need to replace parts...but sometimes a plugged drain or hose can be unplugged by using an air compressor to blow backward through the hose. After an initial blast or two, you may wish to place a bit of water in your machine to help wash it out - supposing you seem to be making progress, of course! Fuzz/lint, threads, buttons and mouse nests tend to contribute to plugs pretty often. A good set of lungs can come in handy on wash day when your washer suddenly stops draining. For best results, remove the agitator before blowing through hose. I just joined the ownership club of a beatty wringer model # BW 3931 D and got it home. I am wondering if anyone has any info as to where I can get parts for this fine machine. everything works well except the drain. it's plugged solid and the little metal cap has broken into a bunch of pieces. Vaughan, your machine probably does not need to have water in the tub in order to test its basic functions. Does there have to be water inside the machine in order for the motor to kick in? I am trying to test the machine but am unable to put water in it at the moment. Lesleya, the gray water may just be from the soap, as some kinds of detergent tend to do this. The oil I'm not sure about. I hope someone else has an answer for you to this problem. i have two, one is a maytag but has the wrong sized rollers. but i actually want to know if anyone has the problem i have. when i wash with either, the water turns gray and a bit oily. which means i cannot reuse my water. i love them both and hope i can fix this problem. This is true, Dan. That's the right and proper way to rinse clothes. However, making do with what one has is an art that shouldn't be lost, either. If I was in a situation to afford (or have room for) all the paraphernalia to make things proper, do you think I'd be using a wringer washer? ;-) Admittedly, it is lots of fun in sub-zero weather when you have to heat water on the wood stove, anyway (with wood you cut and hauled yourself), and your hands come to look like old alligator hide from being chapped by cold water, which you hauled in buckets yourself, waited for the silt to settle, then heated, used, and hauled back out. Meanwhile, lunch needs made, the kids need schooling, and I'm all for short-cutting water usage anywhere I can, regardless of whether it's the "right" way. Sometimes, the right way is what works. As Red Green said, "Any tool can be the right tool." You can't rinse very well in a five gallon bucket. Get yourself a set of double rinse tubs on legs. Wring from machine to tub of water. Plunge up and down in water to rinse and then wring into second tub where you do likewise then wring into your basket. That's how folks who've washed in a wringer forever do it. SinDelle, you've brightened my day! There is nothing that pleases me more than to know that my experiences have helped someone, or saved them trouble. I'm assuming it's just dirt or possibly rust that is the problem. Can you turn the agitator at all by hand, even just a jiggle? If you can, there's probably not much wrong. You might try taking a rubber mallet and tap around the agitator post to loosen any rust and dirt build-up. I should think you should be able to jiggle it loose this way. If this doesn't work, I'm not sure what to suggest, as there usually is no good way to get at the post underneath without having the agitator out. 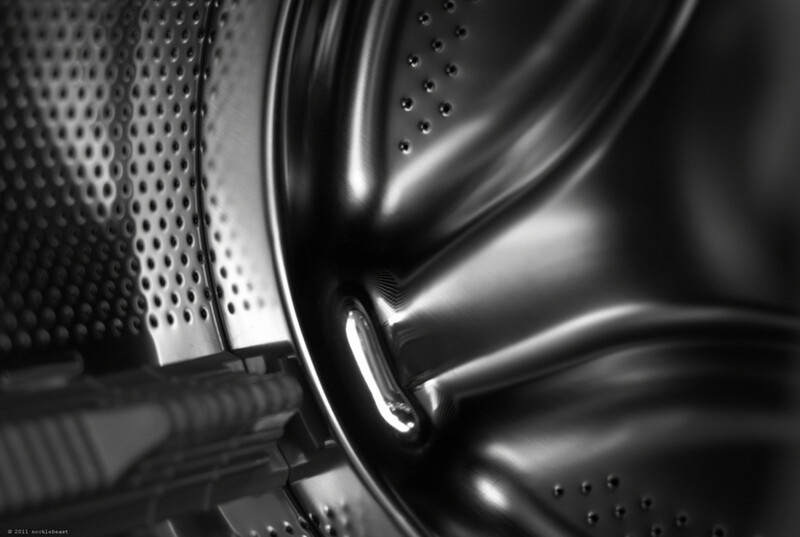 It would be a gamble to try this, but do you know whether your washer drains properly? Is the drain hole and hose clear? It would be possible for mice and such to build nests under the agitator. It would be a mess having a washer with standing water in it, unable to drain and not able to get the agitator out, so you might try blowing backwards through the drain hose to make sure - with your lungs if they're good enough, with an air compressor if they're not. Then, if tapping on the agitator with a rubber mallet doesn't work, you might try loosening it with some water with CLR or something added. Good luck! Please let me know how this goes. I can think of two possible causes for your wringer not functioning. These may not be the only two, however. The most likely cause is the padding material on the rollers may have turned gummy, and sort of glued the two rollers together. You may be able to pry it apart, gently, though this may mar it. 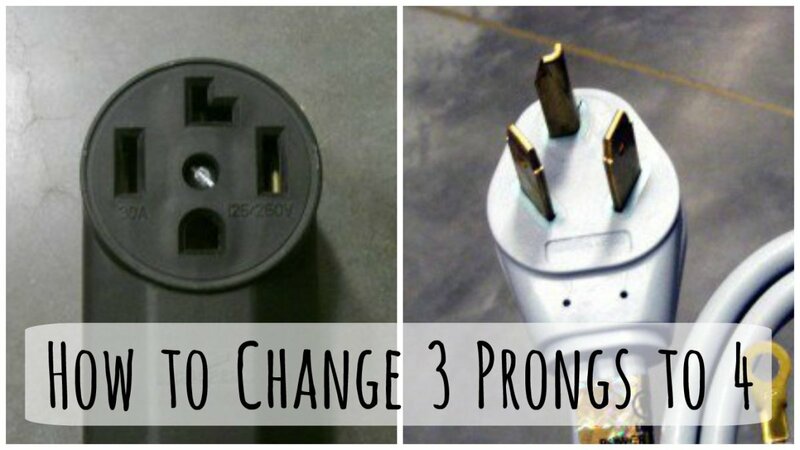 If this doesn't work, consider replacing your rollers. Also, check the ends (take the mechanism and frame apart), and make sure it's not full of dirt or mouse nests or other things that may be binding and screwing up moving parts. The ends of the rollers may need oiled (be careful not to let the clothes touch the ends of the rollers for a few loads after this). To take the wringer apart, you're going to want to lift the whole assembly off the top of the tub, so you can work on it easily on a floor or work bench. Be careful, it's probably heavier than you think. Finally, I suppose it's possible that the lever to turn the wringers on and off may not be functioning correctly. It's been a while since I had mine apart, so can't vouch for what you'll find, but it's possible I think that parts may have come disengaged, and your wringer cannot mechanically function until this is fixed. However, I can't think how or why this may have happened, so consider it a remote possibility. Way to go on this hub. Brought back so many memories of me sitting or running around on our porch when my mom would fire-up her wringer washer that fascinated me to almost acting upon my imagination to act like Superman and stop the wringers with my hands of steel. But my dear mom, rest her soul, had a keen eye for my mischief, so she would head-off every attempt I made to be a real hero. Love how you wrote this. Keep it up. It is true that the wringer can do horrible damage if one should insert fingers instead of clothing. 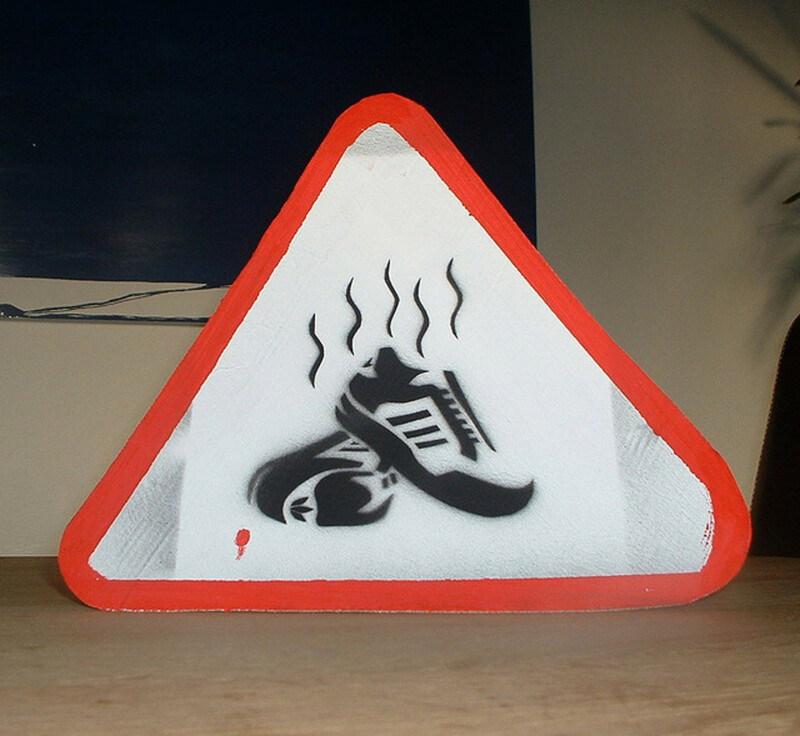 :-) But if used carefully, there should be no serious danger. Mom was always telling me tales about how someone lost an arm; etc etc; lol and to this day I don't know if they were true or just scary warnings! Thanks for the story and the neat tips! You should do a review here on HP on your favorite wringer washer. That would be appreciated, by a dedicated few of us, anyway. If I set my wringer so I can also do thinner, fine things, the jeans don't go through well, so instead of folding them in half (to protect the buttons and/or zipper), we've gone to fastening them before putting them through the wringer. No problems now. I live 30 miles from Anywhere, and an hour from Somewhere, so it is not so easy for me to get supplies. I have been interested in making my own soaps, laundry and otherwise, but have not taken the time to do so yet. Friends have asked me to make goat milk soaps, as I have raw goats' milk available. You are right that Lehman's products tend to be expensive. I was merely trying to point people to a consistent source for off-grid type products, including washers. If you happen to know of a better or more economical source, by all means, share it! I inherited both washers I have used over the last several years. One was in a shed on the farmstead we moved onto over four years ago. It was worn out in every respect when we found it, had been through at least three motors, and when too many parts began to give us problems and finally quit altogether, I replaced it with a washer which had belonged to my grandma. I apologize for taking so long to respond to your comment. I was experiencing serious computer problems for a few weeks. I'm 33, and live in rural Ohio. My mom had wringer washers for nearly my whole childhood. I still remember being in the basement with my mom when i was small, probably 4 or 5 years old, while she washed clothes. Now I'm a mother myself. I bought a brand new high efficiency washer, and matching dryer. They are OK. Uses very little water. But takes FOREVER to wash, and forever to dry. Over an hour each. I still haul sheets, blankets, towels, and filthy work clothes up to my mothers house on nice days to wash everything in about an hour. I always hated crunchy towels when i was little, but now that's the best part. They are much "thirstier" than a traditionally washed and dried towel. I am currently searching for a washer with two tubs. It is hard work, but it's FUN to wash your clothing this way. It makes me feel appreciative that I can choose to live, and do things the way I want. Not necessarily off the grid, vegan, or organic, but it's about consuming less, being kinder to the world, and doing things that I enjoy. Sometimes the weather doesn't cooperate, so I have to use my modern equipment, but it's a chore, not something I enjoy. I live very close to Lehmans that you speak of, but to me the ones they sell are too expensive at $1,000. I know they are with the money, and would outlive me, but just can't do it. I'm searching for a Dexter quick twin machine, and one day soon, I will own one. My 5 year old likes when we use Grandma's (dexter quick twin) wringer washer, it's her job to put things through the wringer, she is very careful, and asks if we can do laundry! We fold jeans in half. Zipper on the inside, and make sure the zipper and button are laying flat. Never break anything that way, and they stay away from the edges of the rollers. I may try to do a video in the spring to show how we do it. I have recently started canning food to preserve it. Some of it I buy in stores, some of it comes from my garden, or my mom's garden. We have spring water, so if we have electricity we are fine! Homemade detergent works extremely well in a wringer washer, it doesn't bubble as much, and is easier to rinse. I make liquid and powder, but the powder is easier to make, use, and store. Much better for a beginner. One cup borax, one cup super washing soda, and a bar of grated soap. My favorite soap is Fels Naptha, second favorite is white Zote, third favorite is pink Zote, and 4th favorite is Vela, a pinkish purple color. I can go to walmart 5 miles away, and get pink Zote, Fels Naptha, Borax, and washing soda. It's not so easy for everyone. The bars of laundry soap are used in Mexico, so if you have a Latin market nearby is a great place to get those. Thanks for this post, it was a joy to read! You are more than welcome. I am glad that I was blessed with someone to share this part of my life with. Believe me there are so many episodes like this, it would make a good "Chicken Soup Stories about Mama's," but I do not know how to format or even get it started. Anyway. Thank YOU dear friend for being My Dear Friend and Follower. I will send you a Thank You note for following when my daughter gets out of the hospital. She needs your prayers. Okay? I was uplifted by this peek into your life, and am glad to be able to pray for the folks you mentioned. I have done so, and will again, whenever I think of it. I meant every word of what I told you. This hub DID brighten my day. My daughter, 38, married with three fantastic kids, my grandkids, is in UAB Hospital in Birmingham, Alabama, been there one week this coming Sunday with breathing problems, but with the Grace of God, she will be fine. I do not drive. I cannot drive with this Fibromyalgia and my nerves so bad that I dare not get on the road with an automobile, but I am at home 2 hours away; my wife, my daughter's husband and oldest daughter are there with her and keeping me informed. I was blessed with a ride up to see her today by my pastor's wife who was good enough to ask if I needed to ride to the hospital. I am not asking for any pity for myself, but may I ask you to pray for my daughter, wife, husband, grandkids, pastor and his wife and everyone who has prayed for her? I do not mean to be so forward, just glad to make your acquaintance as well. Back to your hub. I saw my mother standing with her pink wringer washer and humming "Amazing Grace," true story, she never suspected that I was listening as I played on the porch with her washing. I just cannot express how much I appreciate your writing talent. It is truly a God-send, you and your talent and story. And thank you for the following too. I cherish all of my followers. I will send you a Personalized Thank You email in the days ahead to show you how much I appreciate YOU. Thanks for the story, your friendship and follow, and prayers. I am so happy this article brightened your day. When I wrote it, I considered it strictly utilitarian...but I a have since learned many people do not view it this way. This was one of the warmest comments I have ever received, and I am very pleased to meet you. This is an excellent piece of writing. Amazing, to be honest. I loved every word. Voted up and all the choices because you deserve it. Oh, at the warm memories this brings back. 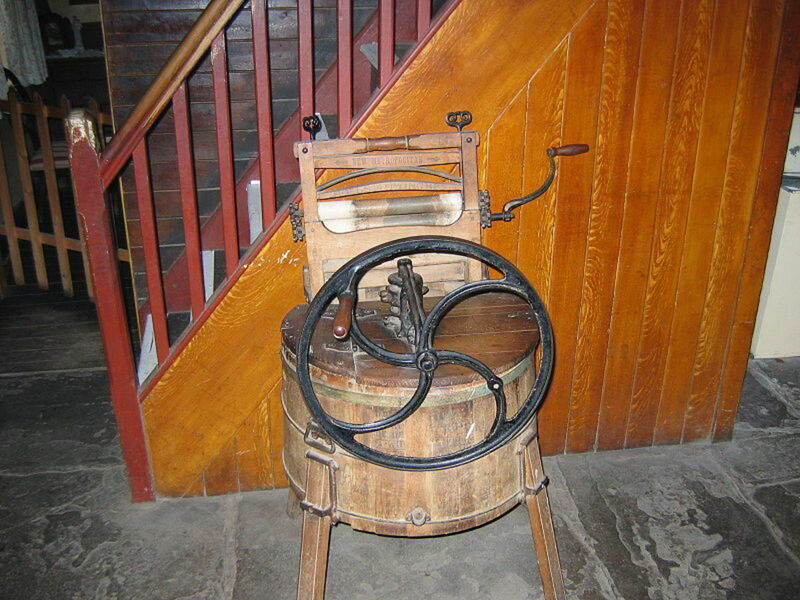 My mom, before she went to work for the public in the textile industry, she washed every Monday and had a wringer machine like this, but hers was pink. I loved the machine and pretended it was my "scientific" project that had a mind of its own. I can still hear the machine rocking back and forth on our front porch. Thank you for allowing me to relive a priceless few moments in my young life. I am presently writing my autobio and had completely forgot the chapter on the wringer washing machine. It sure was great reading about them. Makes me want to have one ...NOW. thanks. Quite true, sir. :-) Thanks for the tip. I am excited to look over your articles, as I see interesting topics that are unusual, and something I may want to learn. (I have a very busy brain.) In the meanwhile, thanks for your lovely visit here. I'm glad we have a rural childhood in common. This Hub is a real gem. I had not even realized that these things even existed anymore, never mind that people still want to use these wringer washing machines anymore. I recall my own mother using one and getting her arm caught right up into one when I was very young. Thank you for taking me back into time and for reminding me of my very rural life when I was a young girl. We've been using S.A.E. 30 in the gearbox, as the washer is in an unheated enclosed porch, and experiences extremely variable temperatures. On the wringer connections themselves, we've been using white lithium grease. A professional would no doubt tell you differently. I just purchased a double dexter wringer washer. while transporting it home oil leaked out of the wringer, does anyone know what type and how much oil I should put in? I'm trying to repair a wringer, but when items are run through, the top portion of the wringer pushes up, not allowing the rollers to remain tight, any suggestions as to what's wrong? I certainly hope you find what you are after, and that you remain pleased with the concept. I am searching for a wringer washer right now. I am sick of how bad modern things that are meant for everyday life are built of poor quality. I love how these machines are still being used after all these years. I'm happy to share the trip with you! Thank-you for this trip down memory lane. I'm 70, most of what you have described herein I experienced in Montreal from 1944 to 1958, love what you have done here, brings it all back to the reality of why, until 10 minutes ago, I would get a wringer washer. I loved the spirea bushes. I can see the wash hanging there. Classic. No, the daylily bed was not yet in existence in those days. Rather, we drained the water into the bed with the spirea bushes and the poppies. 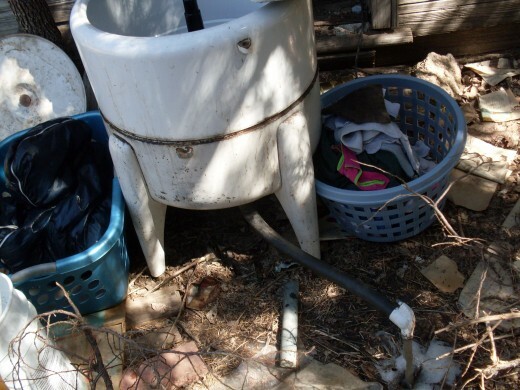 There used to be a child-height clothesline near the bushes too, on which we hung some of the rags, and sometimes the diapers on a regular wash day. You are welcome for the walk! I can picture Grandma with you out there performing this chore. Did she have the daylilly flower bed then? That's the one into which I picture you draining the wash water. I loved the day in early summer when Mom decided it was time to wash all the rags we had used in the last months, and some of Dad's overalls too. Together my parents hauled the wringer washer out of the wash house and onto the sidewalk so the water could be drained into the nearby flowerbed. Then Mom gave us children the instructions and warnings about the use of the wringer, and the fun began. We loved seeing how flat each item was as it came through the wringer, and didn't even mind all the carrying and hanging involved in getting this once-a-year project done. Thanks for the fun walk down memory lane! I have never ruined an article of clothing, but I have had some mending to do, from slight snags (resulting in tears), popped buttons or trim, and the like. And yes, I have had the experience of trying to extract a tightly-wound item from the rollers. :-D I have also had tea towels, apron strings, and such wind tightly around other items, either during agitation or during wringing, and this can be fun, too. Thankfully, though I did use cloth diapers for my children, my diaper days were over by the time I began using a wringer washer exclusively. Did you ever get anything caught in a wringer?or ruined a couple of shirts? piece is often difficult, sometimes impossible without removing a roller. Quite agreed! It can be fun. Especially when it is a nice, sunny day outdoors, and everything is fresh and in bloom. How interesting that was! There is a rhythm to using a wringer. Wash a batch, run through the wringer to the first rinse. Put in second batch into washer, run clothes in first rinse into the second rinse. Run clothes from second rinse into basket, hang them on the line. When you are back, it is time to run the second batch in the wash water . . . and you just keep going. It is work, but it is fast. And, it is fun if you have the laundry gene.